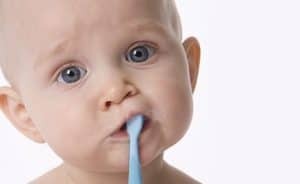 If you are a parent of young children you may be wondering when to start brushing your little one’s teeth. Rule of thumb: It’s never too early. Even before the first tooth is cut, babies’ gums should be wiped with a damp cloth or infant toothbrush after feedings, and as soon as the first tooth comes in it should be brushed. Tooth decay can begin as soon as the first tooth comes in. The first tooth and those that follow should be brushed with a child-sized toothbrush and a smear of fluoride toothpaste twice a day up to age 2. Ages 2-6 should follow the same guidelines, only using proportionately more fluoride toothpaste, depending on how many teeth the child has. Not only does this routine help prevent against cavities and tooth decay, but also sets the foundation for the child to have good brushing habits and a healthy smile for life. Children should visit the dentist no later than their first birthday or within six months of receiving their first tooth. Parents should floss or help floss once per day if any two teeth are touching. Children should only be put to bed or down for a nap with water in their sippy cup or bottle. Milk and fruit juice contain many grams of sugar and can be harmful to your child’s teeth. Anytime children consume sugary drinks or snacks, their teeth should be brushed afterwards. If your child is in need of a dentist please call 844-365-DENTAL to find a Dental365 location near you. The friendly and knowledgeable staff will welcome your child with open arms and make sure your child gets the care they deserve.